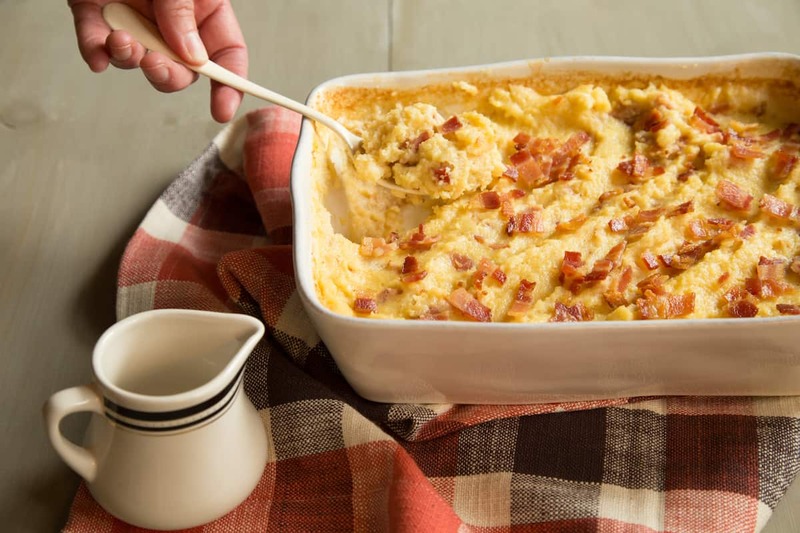 Maple Bacon Polenta Casserole | Good. Food. Stories. You would think that calling a food “mush” would be a surefire way to get your kids not to eat it. But my sister and I were apparently weird kids, so this particular bit of reverse psychology worked in my dad’s favor when it came to our weekend breakfasts. Even weirder was the fact that my dad’s “mush” actually wasn’t very mushy at all—it was polenta from a tube, sliced and pan-fried to a crisp, served at breakfast with butter and maple syrup (for me) or nothing at all to accompany it (for my sister—see, total weirdness abounds). It definitely sounded weird to our friends who were treated to this particular dish, but our family must have been trendsetters when we were eating polenta for breakfast way back in the 1980s and ’90s. These days, polenta is a frequent accompaniment to savory dishes of all kinds: meatballs, short ribs, pork ragu, mushrooms, braised kale, roasted tomatoes, or just a heaping handful of Parmesan. But its status as a breakfast food shouldn’t be discounted. This baked casserole ditches the hands-on pan-frying of sliced polenta and uses dried polenta to make a creamy, spoonable dish. 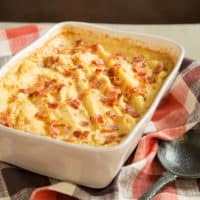 If you’re fretting over the loss of those crunchy edges, don’t worry—there’s still a hit of salty crispness from the bacon folded into the polenta and sprinkled liberally over the casserole, offering contrast to the subtle sweetness from the maple syrup baked into every bite. And if, like me, you consider polenta to be an ideal syrup vehicle, by all means serve more at the table. The casserole will continue to absorb the milk as it cools, so don’t delay in spooning it out. Mush! 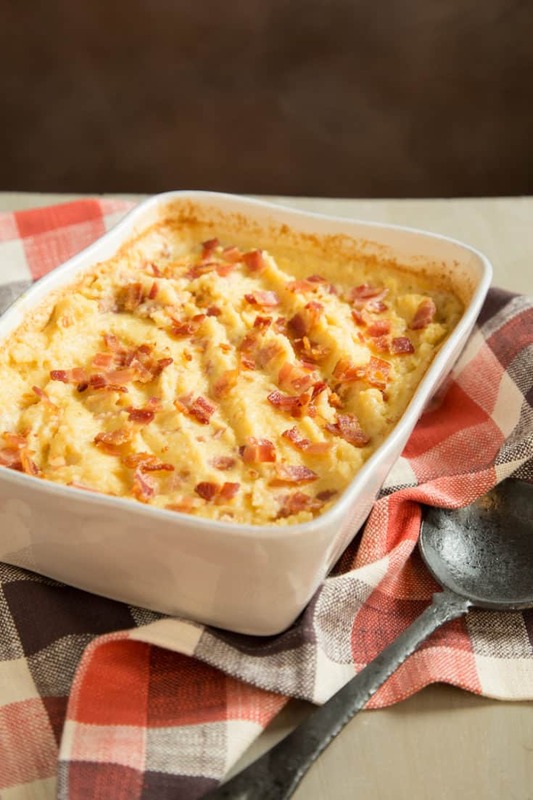 This creamy maple bacon polenta casserole makes an ideal brunch dish—oven-baked and ready to serve a crowd. Don't forget extra syrup on the side! Set a wire rack inside a large rimmed baking sheet so it fits snugly and line the bacon up on the rack. Bake for 15-20 minutes, until the bacon is sizzling and crispy. Chop all but 2 of the cooked bacon slices. Place the chopped bacon in a 9-inch glass or ceramic casserole dish, then stir in the polenta, milk, maple syrup and salt. Bake for about an hour, stirring every 20 minutes, until the polenta has absorbed the liquid. While the polenta bakes, chop the remaining bacon. Sprinkle the bacon over the cooked polenta. Serve immediately with additional maple syrup for drizzling if desired.